In the late 1970’s and early 1980’s the Pacific coast of Mexico supported the world’s largest nesting colony of the Critically Endangered leatherback sea turtle (Dermochelys coriacea). One study calculated that of the 115,000 female leatherbacks nesting throughout the world, 75,000 turtles used the beaches of Michoaçan, Guerrero, and Oaxaca, Mexico (Pritchard, 1982). That nesting population has declined to less than 1,000 turtles (Sarti et al., 1996). Cause for the decline was unknown until the use of satellite telemetry demonstrated that post-nesting leatherbacks from Mexico were moving to an area of the southeast Pacific Ocean where they were being killed incidental to swordfish gillnet operations. Eckert and Sarti (1997), proposed that at least 3,000 turtles were killed per year in these fisheries which dwarfed all other sources of mortality. While gillnet mortality was clearly a primary cause of the decline of this population, it was probably not the only factor leading to its demise. Other perturbations to the stability of this population had been underway for many years, particularly uncontrolled egg harvest and the killing of adult turtles on the nesting beaches. Finally, recent studies suggest that a changing environment might have also played a role in the decline of the eastern Pacific leatherback. One such study (Saba et al., 2007) proposed that a reduction in oceanic productivity within the SE Pacific is extending the remigration interval (number of years between nesting seasons) of leatherbacks nesting in Costa Rica. Such a lengthening of the internesting interval might well represent a reduction in turtle reproductive fitness, as sea turtles will delay reproduction until they have sequestered the energy stores needed for migration and the production of eggs. Satellite tracking data from Costa Rica has demonstrated that these turtles move to similar areas as those from Mexico to forage (Morreale et al., 1996). Particularly useful to a goal of understanding habitat use by eastern Pacific leatherbacks is the dive information reported by their transmitters. Leatherbacks vary dive behavior based on where food is available as well as to accommodate their environment (Eckert, 1996; Eckert, 2006). As a species that relies on geographically and temporally distributed prey, leatherbacks must specialize on selective patch feeding. While yet to be proven, our current ideas about leatherback foraging are that they are not opportunistic foragers. Instead they specifically target certain jellyfish species and populations both in time and space, to maximize efficient energy uptake. Thus, leatherbacks move thousands of kilometers to reach high energy feeding patches, which may occur at the surface or great depth (Eckert, 2006). By linking dive behavior to movement actions we should be able to predict foraging areas. When this data is coupled to remotely sensed oceanic environmental variables characterizing foraging habitats is possible (Eckert et al., in press). This project interpolated track data, applying a switching state-space model (SSSM) to each of the turtle tracks (Eckert et al., in press; Jonsen et al., 2007). These provide a valuable tool for modeling movement data by simultaneously accounting for measurement error in the satellite positions and variability in the movement dynamics. Improved position estimates are obtained at regular time intervals and for each location an estimate of the turtle’s behavior, transiting or foraging, is given. 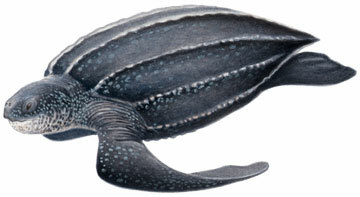 Next, we identified and characterized foraging habitats for the Mexican leatherback sea turtle. Using the SSSM behavior estimates, travel rates and dive patterns identified important foraging areas. These areas were characterized using oceanographic variables such as bathymetry, ocean currents, sea surface temperature, and phytoplankton biomass to determine which factors are most important in providing suitable foraging habitat. We also identified internesting habitat areas by using kernel estimation to determine the location and size of the offshore area used during between nest events. This will be compared to newly proposed coastal fishery exclusion zones.